Barnsdall, Oklahoma — 97-year-old Arthur Moore peers down into an open ditch to inspect a new 2-inch polyethylene water line for his 136-tap rural water district in Northeastern Oklahoma. He shuffles his boots as he goes and the white hair and unhurried movements seem out of place on a construction site. Nevertheless, Moore is up to the job and it is fitting that he is the inspector of the pipeline because in many aspects, it is his water district. He was the visionary who started the water company eons ago which has the bragging rights of being the first rural water district in Osage County Oklahoma and the second for the entire state. He is still a member of the water board, which holds its monthly meetings in his living room where he has lobbied for the past several years for the use of high-density polyethylene (HDPE) pipe for the district’s much needed infrastructure rehabilitation. They’re finally taking the old man’s advice. 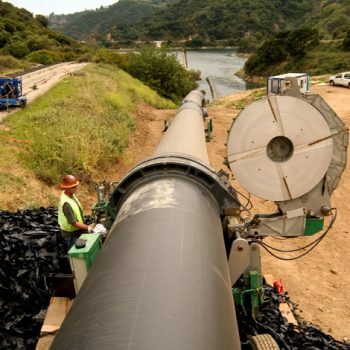 From small rural water districts to giant municipalities like Houston and Los Angeles, HDPE is finding its way into water systems and proving to be a piping material with benefits that can no longer be ignored. State and Federal Governments are also getting into the act with their own HDPE pilot projects and everyone using the pipe has a few common goals driving their efforts – conservation of water through elimination of leaks, reduction of maintenance costs over a long-life expectancy, and upfront savings on installation. 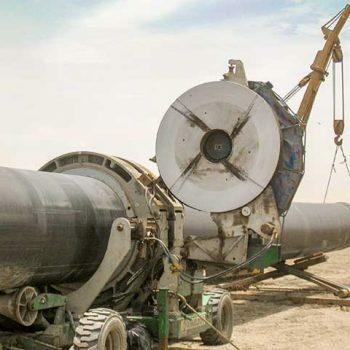 The material’s use for water applications has been climbing over the past several years but rose sharply in 2004 when sales of HDPE water pipe over 3-inches in diameter jumped 54% above 2003 figures. It is a trend that many in the water business say is here to stay and the entire polyethylene industry is ramping up to serve the impending boon. One industry indicator of HDPE’s growth in water is the new manual being published by the AWWA. It is due out in the fall of 2005 and intended to help civil engineers design polyethylene water systems. Another is the number of independent polyethylene pipe manufacturers popping up across the country along with HDPE pipe distributors who are expanding by adding stocking and sales locations. These expansions are more prevalent in areas where the tough groundwork of getting municipalities to try HDPE in a pilot project has already been done. A further sign of polyethylene’s market growth is that McElroy Manufacturing, the leading manufacturer of polyethylene pipe fusion equipment, is in the process of doubling the size of its manufacturing facility following several years of record sales that they believe in large part is coming from the water industry. 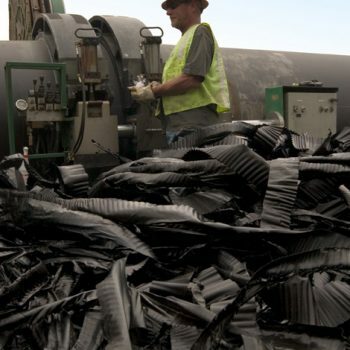 The increased use of HDPE is a direct result of water troubles plaguing the U.S. Water is rapidly becoming a hot commodity due to record droughts, increased pollution of water sources and a growing demand from population growth. Forbes Magazine tagged water ‘The Oil of the 21 st Century,’ but to the science community, water is far more important than oil. There are countless numbers of bright people developing energy conservation technologies and speculating on what the world will do if its oil reserves are on the downward slope. The topic has become routine within political speeches and it is certain that eventually science and technology can replace oil with another form of energy. But water, which is mandatory for life, has no replacement. If the notion of running out of clean water seems implausible, consider that the Colorado River, once a mighty river, now arrives a mere trickle at its delta in the Gulf of California. Low flow levels are afflicting most of the rivers in the West but now, similar problems are occurring in Florida, Arkansas, Georgia, and other parts of the country that have never seen these troubles before. The Ogallala Aquifer, which is the largest in the U.S., is responsible for irrigating at least one fifth of all U.S. cropland and is being depleted at ten times the rate of natural recharge. In fact, some places overlying the aquifer have already exhausted their underground supply to levels that make it economically unattainable for irrigation purposes. In addition, population growth and pollution are working together to further strain limited water supplies. Almost half of U.S. waters do not meet the standards of the Clean Water Act for fishing and swimming which originally set the goal of making 100 percent of U.S. waters clean by 1983. 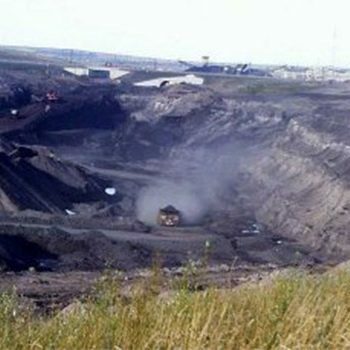 And according to a report by the EPA, more than 60 percent of industrial and municipal plants violated their Clean Water Act permit limits in the first six months of 2002. Additionally the number of beach closing/advisory days due to pollution at America’s coasts, bays, lake shores and rivers increased by 51 percent between 2002 and 2003. Granted, the water problems in the U.S. pale in comparison to other parts of the world where over 9,000 children die each day from lack of clean water but it is time to take serious conservation action in the U.S. and polyethylene proponents say their pipe is a tool that can make a big impact on the crisis. The area of concern is the U.S. water piping infrastructure that is far past its expected life span. An estimated 20% to 35% of the water carried through U.S. infrastructure is lost due to leaks and corrosion. Holding on to the 2.4 billion gallons of treated water that is lost every day through infrastructure would go a long way in solving some of the shortage issues. The EPA says to cure the wasteful infrastructure will take 276.8 billion over the next 20 years. Current government funding is so far below the amount needed that there is a movement to set up a trust fund like those for highways and aviation. Trust fund advocates have looked at several potential revenue sources, including a fee on water-based recreational products and services, (which is a $50 billion industry), industrial discharges, flushable products, or beverages, as well as a combination of some or all of the above. Apparently, all options put forth by trust fund advocates are based on the assumption that the beneficiaries of clean water have the primary responsibility for guaranteeing clean water. However, none of the sectors identified by trust fund advocates as potential funding sources are jumping up and down to support a fee or tax on their activities. Nevertheless, hope for increased federal funding may be on the horizon and a bipartisan bill was introduced in July by the Senate to increase funding for water and wastewater infrastructure to $38 billion over the next five years. Without the funding, some fear that water-wars are inevitable, particularly in the arid West which is already plagued with court battles over water. In many cases, water is over-appropriated and there is less water available than there are legal claims to it creating a whole new set of problems. The government is aware of the quandary in the West and has even developed a ‘hot spots’ map where expected water-wars will occur. The lawsuits are wasting millions of dollars in litigation fees while providing no relief to the root of the problem. The infrastructure problems are the result of neglect, but it is hard to place the blame on water managers who have the daunting and full time task of chasing and repairing leaks with little or no funding. It is a tough decision for a civil engineer to take on the perceived risk of switching materials while taking a time-out, to enroll in the new school of HDPE 101. But it is crucial that water be transported as a precious commodity, and the polyethylene industry says they’re pipe does it better than any other. “Water has defined and shaped the lives of the people who live in the West,” says Brian Shields of High Country Fusion based in Fairfield Idaho. Shields has been selling HDPE pipe to farmers who are replacing open irrigation ditches with pipelines to conserve water. He is standing by a picnic table that is positioned over a hundred yards from the shore of a lake in Southern Idaho. “This picnic table used to be at the waters edge,” He says as he points across the lake to the far bank which shows old elevation levels which have stained dark lines into the rocks. The current lake level is at least fifty feet below the old mark. Shields is talking about a 19,000-foot 24-inch HDPE pipeline that will replace an open irrigation ditch for a conservation-minded farmer. The pipeline will not only conserve water, it is an energy saver, and the federal government is so impressed with the project that it is paying for half of the construction cost. It is not the only project the government is involved with. Two pilot projects on military bases have become models of study for the hundreds of military bases spread across the country. One such project took place on a former Naval Station, Tongue Point Job Corps Center near Astoria , Oregon . After three emergency water breaks in a one-month period that cost the center $10,000 to $15,000 each, officials at Tongue Point decided to replace 10,000 feet of asbestos water lines with a totally fused HDPE water system. About 80% of the project was done with pipe bursting and 20% open cut methods. One critical benefit HDPE provided was its flexibility. The base sits on an earthquake zone with unstable soils. 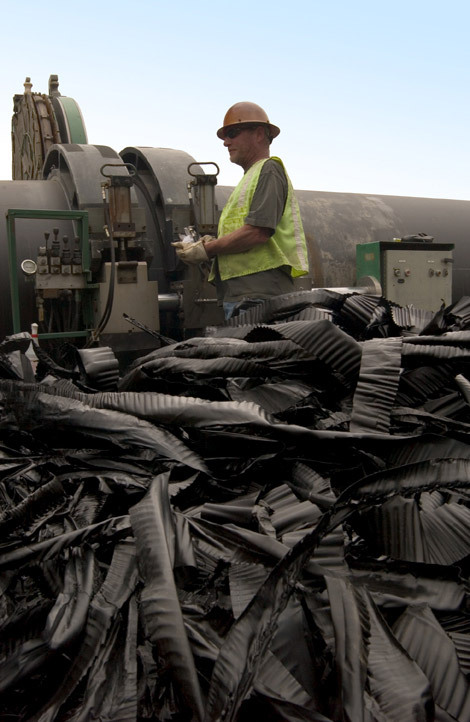 HDPE has the ability to withstand tremendous force and dramatic earth movements and has survived major earthquakes. Another significant reason for using pipe bursting and HDPE is the 12-inch thick layer of concrete over the base. A traditional open cut operation would be quite expensive. But the maintenance free aspect of HDPE was of the most importance to officials of Tongue Point because the base buys its water from nearby Astoria , but the municipality is not responsible for maintaining the system. The Job Corps Center wanted a system that would be leak free with no maintenance problems in the future. Another government project took place at Fort Carson, located near Colorado Springs. The base is home to 19,000 soldiers and is a community in and of its self. Its infrastructure was leaking like a sieve and made up of at least five different piping materials. After years of six figure maintenance headaches, the Corp of Engineers decided to install a new HDPE 20,000-foot totally fused potable water system to eliminate the maintenance troubles and conserve water which it buys from Colorado Springs. Fort Carson took the strategy from Colorado Springs Utilities (CSU) which made the switch to HDPE about five years earlier. CSU was not only lured to HDPE by the desire to be good stewards of their water; it’s also about the money. CSU is a privately held water company and claims millions in savings due to trenchless construction methods and HDPE over the last five years. 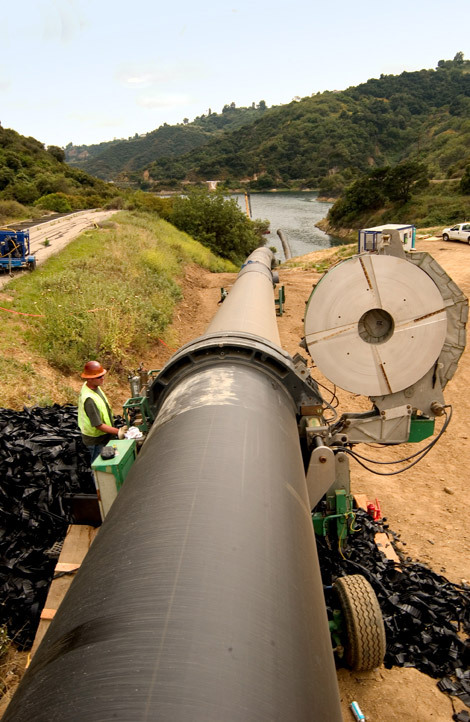 They consider HDPE a tremendous investment for their bottom line because they can get paid on 100 percent of the water they process and deliver. It’s a logical conclusion. If a water company can get paid on all of the water it produces without losing any through leaks, it has a better chance of operating in the black instead of the red. This is the leak-free message coming from the HDPE industry but the majority of water municipalities have been slow to change from traditional methods and materials. Many civil engineers are quick to note that by laying a new DI or PVC pipeline, a practically leak free system can be achieved as well. But it is the “new” that is the important bit. Mechanical joints will start to experience problems, sometimes in the first few years, and these troubles grow as the system ages. The big savings with HDPE comes from not having leaks and huge maintenance expenses over the next 50 to 100 years. There is no question that there is financial payback in using a leak-free, maintenance free system. However, the long-term life-cycle cost savings is a tough sell to most municipalities who are under funded and fighting for every scrap of the yearly budget. In many cases, water shortages concerns, complying with mandates, and pressure to show returns on a much shorter timescale are trumping long term investments. But a growing number of success stories are starting to make the water industry wake up and smell the money. A s HDPE becomes more prevalent on bid specifications, creative engineers are also finding upfront savings on installation. For example, the Water Resource Council, which is responsible for all of the Water Industry Standards in the UK where HDPE is the preferred material for water pipelines, has determined that HDPE pipe systems always have the lowest installed cost in sizes up to 315mm (12-inches). When considering trenchless applications, the savings are even greater. A job in Arizona by the Central Arizona Project discovered that the installed cost of HDPE was $125,000 less than other materials. They didn’t know this in the beginning because HDPE was not one of the pipe options available on the bid application. The winning contractor offered the HDPE savings only after securing the bid with a material other than HDPE. The pipeline is a gravity line including 24 through 63-inch diameter pipe. Another similar savings was discovered by the largest water municipality in the nation on its first project using HDPE. 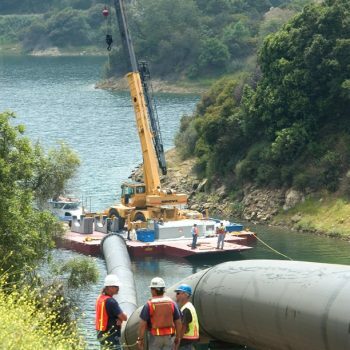 L.A. Water chose to use 63-inch HDPE to cross a lake in a float and sink operation instead of tunneling around the lake with another piping material. The cost savings were enormous which is why the pipe was chosen. But engineers with the municipality are impressed with the ease of working with the material and the project has likely opened the door for more HDPE use within its system. 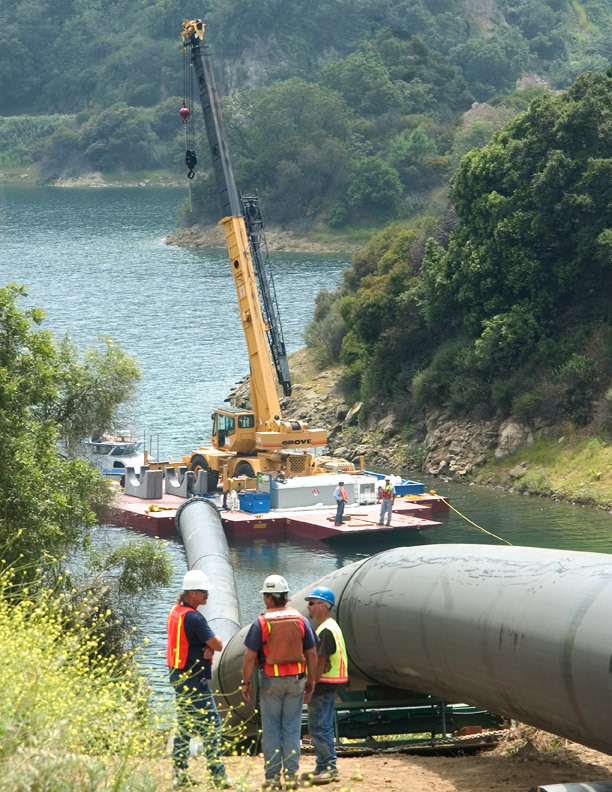 It is the same process that is bringing HDPE to the water industry across the nation. Arthur Moore is sold on HDPE for his rural water district in Northeastern Oklahoma. He views HDPE as just another improvement in an industry that has been through much advancement during his 97 years. He has repaired more leaks in his water system than he can count but hopes the new HDPE pipe will finally put an end to the headaches of constantly patching and repairing leaks. The $3,500 investment has become a 136 tap system that now has a waiting list of people wanting to join, along with the potential to easily double or triple in size due to urban sprawl from nearby Tulsa. Moore is excited about the economic impact it could have on his tiny hometown that is, “shrinking and withering away faster than I am,” he says. He sometimes spends entire weeks working to get federal funding for his water district and is known as somewhat of a slave-driver by the rest of the volunteer water board. But it was this tenacity that got it going in the first place and the same work ethic for which his generation is famous. They are the ones who built our national water system which is one of the greatest achievements in the history of the country. But now it is tired and neglected, showing its age, and in dire need of repair. It’s time to take up the torch carried by this generation of water workers and use the best technology, materials and engineering available to plan for the future.